All Palazzo Rugs by EBRU are original Persian Kerman Rugs which were hand knotted in the early 50’s and 60’s of the last century. The history of the Kerman Rugs starts in the region that they thank there name to: The Kerman Region in the South East of Iran, nowadays part of the world Heritage. 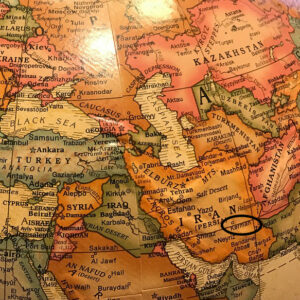 Capital of the Kerman Region is Kermän, one of the largest and most developed cities in the South East of Iran. Kerman has been a major centre for the production of high quality hand knotted rugs since at least the 15th century. The high quality wool( called Camania )that is collected in the Region, combined with outstanding Craftsmanship make the Kerman Rugs one of the finest Persian Rugs. 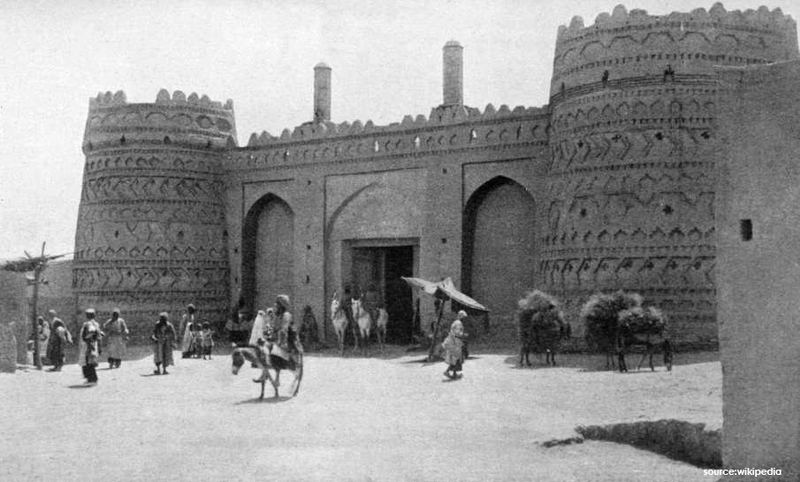 In the 17th century the Kerman Craftsmen were highly inventive and their techniques were from outstanding level, in those days they were the most professional Craftsmen with techniques that weren’t seen anywhere else in the Persian Empire. During that time the weavers set their looms in a specific way so that the cotton wraps were on two different levels, leaving some wool tight and some will bend which gave the Kerman it’s wavy finish. With this outstanding craftsmanship and unique new techniques the revelation of the Kerman began. The design patterns of Kerman Rugs are a distinct feature, the Kerman Rugs from the 16th and 17th centuries are known for their all over pattern of beautifully stylized flowers, oversized Palmettes and Vases that were placed all over the Rugs. The inspiration for the floral patterns that were used came from the scarfs that were produced in Kerman. From the beginning until the mid-19th century Kerman was even the centre of production for these scarfs. Trough centuries the patterns changed, because of wars, western interventions and off course the upcoming trends in patterns. 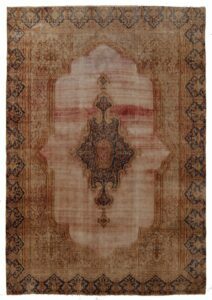 The first big change for the Kerman rugs came after the end of the first world war, this period is called the “regression era” and shows many detailed designs with centrepieces, Shah-Abassi Flowers and Quarani Designs which were made to satisfy the American Market. During that time approx. 90% of the Kerman industry depended upon the American market. The consequences of the American depression were devastating for the Kerman Production. After the Second World War the demand for Kerman rugs from the western countries grew again, this time the French customers wanted to give the Kerman a French touch and gave orders to make rugs like Aubusson and Savonnerie rugs. A total new chapter in the amazing history of the Kerman Rugs was that the French designers began to send their drawings to Kerman for production. We call this period the Gumblin period which was dominated by the French designs. The freedom to choose patterns and to experiment with their techniques came to an end for the talented craftsmen of Kerman. The Result was that the authenticity of the Kerman rugs was fading away and that the quality got less. The French designs were totally different from the authentic Kerman designs and because of the pastel colours that were requested, they had to start washing their Kerman Rugs with chemical washings instead of the natural washing that were using until then. The price dropped because of the mass production and the use of pour quality wool. The 1940’s were the black page in the book of the Kerman Rugs, thankfully the Region regained its strength and took back control of the Kerman production by the end of the 40’s. As a family company for more than 35 years, EBRU has different productions all over the world. As the Brothers Gunaydin were visiting one of their productions in Iran 15 years ago they noticed the large amount of beautiful Rugs that were discarded because they were damaged. When you have a passion for rugs it hurts to see how a part of history that can be saved and given to a new generation to enjoy is destroyed because nobody wants to give these rugs a second life. The Rugs were Tabriz Rugs, EBRU started to repair them, to give them a new wash to get their original colours back and gave these rugs a second life. Sometimes the rugs were so damaged that only pieces could be reused and so the Vintage Patchwork Rugs became a part of our Collection too. The amount of good quality Tabriz rugs that could be reused got smaller and the fine quality that we love at EBRU couldn’t be met anymore so EBRU stopped with the collecting of Tabriz Rugs. For more than 6 years the Brothers Gunaydin could not find an alternative that met the high quality standards of EBRU and so there were no new Vintage Rugs for over 6 years. During all these years the search went on and eventually they found the Kerman rugs and this was love at first sight. It is a very specific search that the Gunaydin Brothers do themselves until this day to find the best Kerman Rugs in the world and give them a second life. Because of the patterns and quality differences it is key to find the right ones that are a match with EBRU’s quality standard. The Kerman Rugs are repaired when they have holes, scratches of other damages and get a wash to give them back their original colours. The result is a top collection with only the best pieces that can be found worldwide. 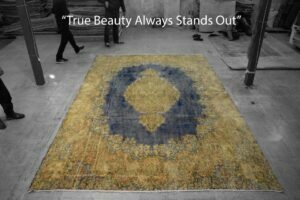 At EBRU we are proud that we can give these Beautiful Rugs with a rich History a second life and that these pieces of art can be shown to a whole new generation once more.